Hello everyone! I made this quick meal in less than 15 minutes! 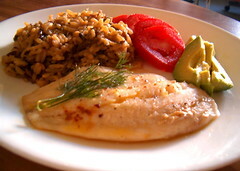 If you're not familiar with Tilapia it is a great light fish that is easy to flavor and is a favorite in our home. It's price is very affordable with a big bag costing less than $8 on sale at our store. These normally last us at least 2 nights worth of dinner. Bake for 12 mintues or so until the fish flakes easily with for. In the meantime, boil the instant rice. Use the lemon juice from the baking pan to make a quick sauce with melted butter. Pour over the plate and season.